The mshcMigrate utility was developed by The Helpware Group in partnership with Microsoft and allows you to migrate older help content (MS Help 2 and MS HTML Help 1.x) to MS Help Viewer format (.mshc) used by VS 2010/2012/+ and Windows 8/10/+. Migrates both HTML Help & MS Help 2 to Help Viewer format. Converts projects files (.hxc, .hhp) & compiled help files (.hxs, .chm), as well as help source folders. Outputs include .mshc & .cab help package files as well as the .msha manifest file. The application includes several additional tools that allows you to test, install/uninstall, view the HelpLibManager output log, perform API calls, and explore the help library data store. The utility can also be operated in batch mode for overnight builds and command line operation. The utility is part of Helpware's FAR HTML v5 product set which provides advanced meta tag editing and TOC/Index editing for MS Help Viewer projects. MshcMigrate can also be downloaded and licensed separately (see licensing section below). Outputs to both .mshc and .cab help file formats. Includes a .mshi Index file into the .cab if available. Generates a .msha manifest file for installing. Batch mode for unattended operation. Rezip (Update) any folder to a .mshc help file. Converts Index and TOC files to topic meta tags. Converts embedded topic tags to topic meta tags. Converts topic HTML source to the required XHTML format. Converts link paths to topics, images, CSS & JS files. Allows you to use Visual Studio branding or use your own JS and CSS via the SelfBranded meta tag. Manifest page: Create a .msha manifest file using one or multiple help files. Required for installation. Help Library Manager page: Run the HLM application. Shows the various command line options. View the HLM event log and get notifications as errors are logged. Help Library Agent page: Test the various MS Help Viewer API calls. Test your help. A powerful aid for both authors and programmers. Help Library Store page: This page rips through the meta data in the Help library data store and displays the content and location of all help packages installed on your PC. You can also view the source and decompile help files. The .mshc help format is the same for VS 10 and VS 11 (VS 2010 and VS 2012). So the core migration code has not needed to change moving to VS 2012 (VS 11) and beyond. 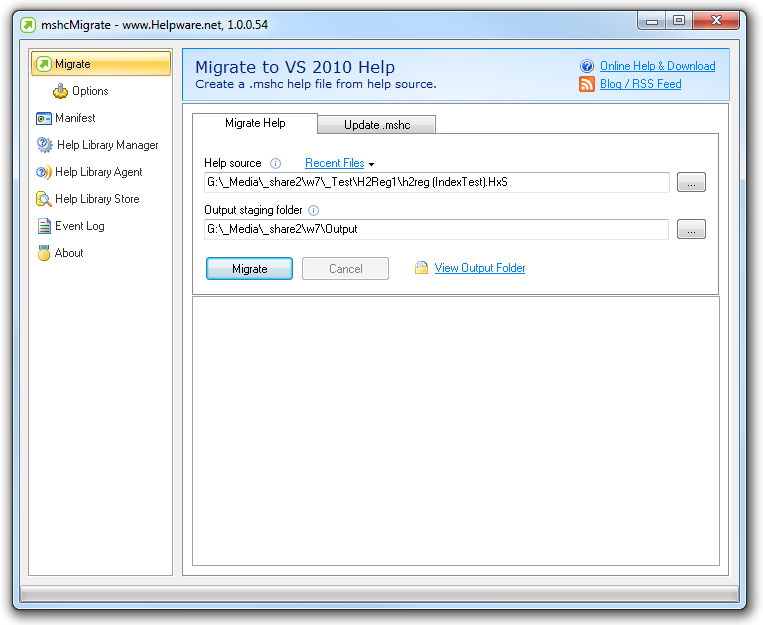 The help run-time executables and catalog store are now different in VS 2012 (VS 11), so the latest version of mshcMigrate now let's you select between HV 1 (VS 10 help) and HV 2 (VS 11 help) when registering or viewing help. There are several annoying problems in MS Help Viewer 1.0. Help Viewer 2.0 should be better. We've list some of the problems in the Help 1.0 Notebook page. .HxS Migrate + decompile requires MS Help 2 (ie. VS 2002/2003/2005/2008 installed). If you like mshcMigrate please leave a Rating or Review. If not, tell us why so we can fix it. Beta drops. Try new features. Any Beta download will be available at the end of this page. Commercial use of this software requires that you purchase a license to help support this project. Purchasing a license gives you email support for when you get stuck; Encourages us to keep the tool up to date as new versions of VS help come out; and removes a nag screen from showing. Note that customers who own a copy of FAR HTML v5 are already licensed. If you are a licensed FAR HTML 5 user and have FAR 5 installed then the mshcMigrate about box will say "licensed". The license is a "per user" license. So if user X owns a FAR HTML v5 license, then user X may install FAR and mshcMigrate on multiple machines and concurrently run all copies. If you own a team, site or world license then sharing is not an issue. Purchase mshcMigrate - Buy a license for mshcMigrate or FAR HTML 5 (mshcMigrate included). License.txt File - How to enter your license codes. End User License Agreement - For companies who need the legal stuff. If you own a mhcMigrate license, or a copy of FAR HTML v5 then you may contact us directly for support. Please try the public support groups first if possible. - Community group of VS 2010 help integrators. Run by MVPs, with MS presence. - The official MSDN discussion group for help has been discontinued. MS suggest posting in the VS General.